In bulk printing mode again. 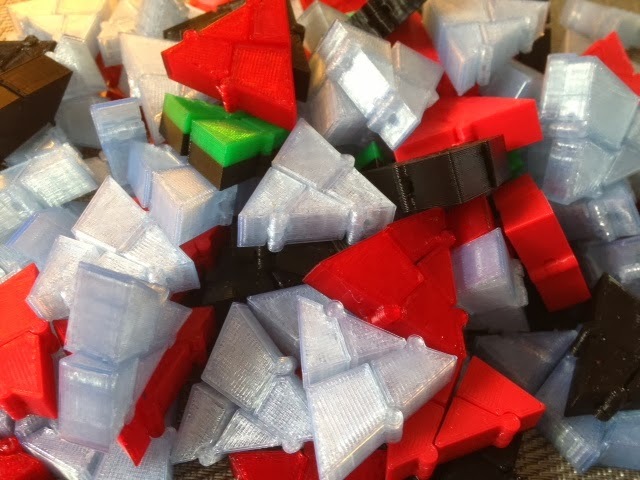 Over the past few days we have printed 100 of the Hinged Triangle-Square models from Day 189, for a giveaway at an upcoming conference. Many more to print but a hundred is a milestone worth a picture, don't you think? Settings: MakerWare .3mm/low with linear fill with no support and no raft, on a Replicator 2. I've been printing six at a time, which takes about an hour. I'd do more but my build plate is warped - I know I should just order one but it is expensive! My reliability has been great, with just one lemon in the hundred I've printed so far. On one of the print runs I ran out of green filament halfway through and switched to black, as you can see in the picture.